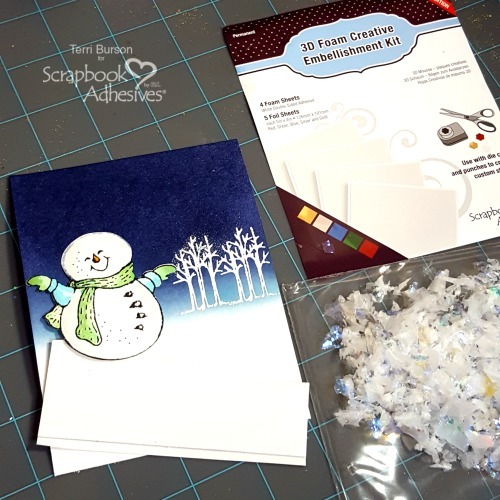 It’s a snow flurry kind of day here on the Scrapbook Adhesives by 3L blog. 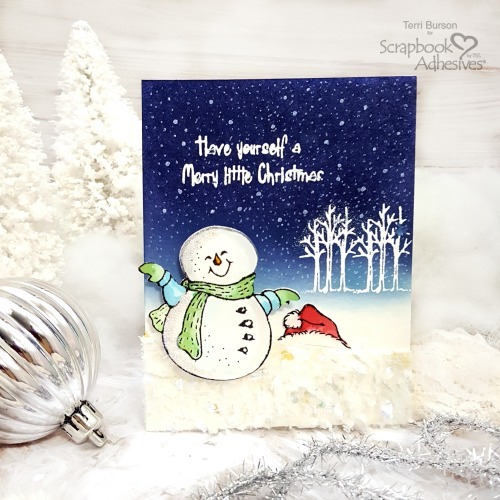 Hello friends, Terri here, and todayI’m showing fun ways to add texture and sparkle to your wintry themed Christmas cards. I always look for versatile ways to use my products. If a product can be used in multiple ways, it’s liable to find a permanent home in my craft space. The 3D Foam Creative Embellishment Kit fits the bill. 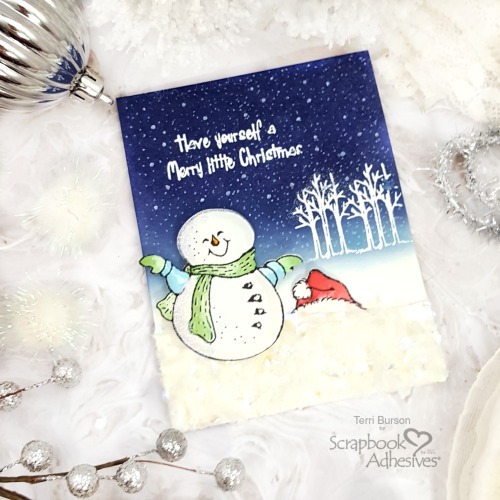 You can glitter it, emboss it, color it and even top it – as in snow! To begin, I grabbed some inexpensive iridescent bagged snow. I trimmed my creative embellishment sheet into a slope shape, peeled the lining and pressed it into the snow. Once this was applied to my card panel, I used scissors to trim the ragged edges. 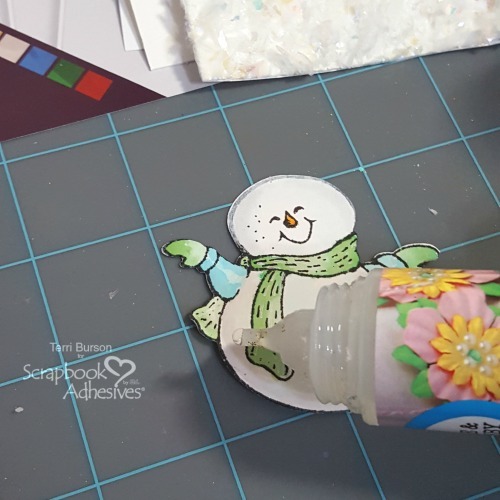 My Stampendous snowman needs a little frost, don’t you think? I applied glue from my Dual Tip Glue Pen along the entire left edge, then sprinkled with crystal glitter. 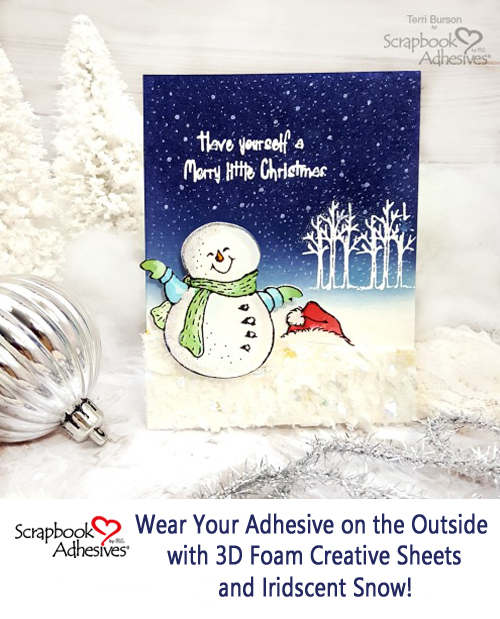 It’s a great way to Wear Your Adhesive On The Outside! 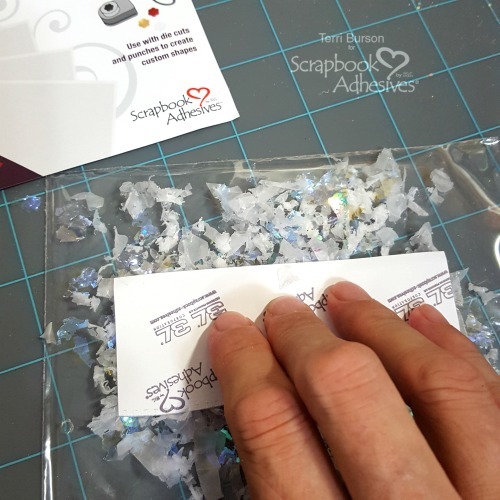 After heat embossing my sentiment, I adhered the scenic panel to my top fold white A2 sized card using my E-Z Runner® Grand Refillable Dispenser and E-Z Runner® Grand Ultra Strong Refill cartridge popped in. I rely on this combination to securely adhere my watercolor panels. Lastly, I added lots and lots of tiny snow dots to my distress ink blended background on watercolor paper. A white gel pen is great for this. Make sure your background is completely dry, or your white gel will turn the color of your background! Give these fun techniques a try and let the kids help with the snow! If you’d like more information on the products that I used, stop by my blog at Waving My Wand. This entry was posted in 3D Foam Creative Sheets, Adhesives, Cards, Crafts & Tutorials, E-Z Runner® Grand, HomeHobby by 3L, Intermediate, Other Adhesives, Seasonal Craft Ideas, Skill Level, Wear your Adhesive on the Outside, Winter and tagged 3D Foam Creative Embellishment Kit with Foil, 3D Foam Creative Sheets Mix, Brutus Monroe, Christmas, Clearsnap, Dual Tip Glue Pen, E-Z Runner Grand Dispenser, E-Z Runner Grand Ultra Strong Refill, HomeHobby by 3L, Marvy Uchida, Neenah, Ranger Ink, Sakura, Snow, Spellbinders Paper Arts, Stampendous, Strathmore, We R Memory Keepers. Bookmark the permalink. 2 Responses to "Snow Flurry Card"
he’s out in the cold. Darling card.